Healthy Lifestyles For Healthy Living! Let's get excited about being healthy! Your hair will even thank you for it. We often take it for granted, yet water is by far the nutrient most needed by the body. Inside our bodies water performs many different tasks that are vital to us living well everyday. It transports nutrients needed to nourish the cells in our body, for example. Water acts as a shock absorber in joints and around the spinal cord and helps maintain our body temperature. Adults take in and release out some one and a half to three quarts of water a day. Although most of the water we take in comes from juice, milk, soft drinks, and other beverages, including tap water, foods also add considerable amounts of water to the diet. Water makes up 85 to 95 percent of fruits and vegetables, for instance. Lack of water can lead to dehydration, a condition that occurs when you don't have enough water in your body to carry out normal functions. Even mild dehydration can drain your energy and make you tired. On a hair perspective dehydration can also cause dry hair and breakage. So how much fluid does the average, healthy adult living in a temperate climate need? The Institute of Medicine determined that an adequate intake (AI) for men is roughly 3 liters (about 13 cups) of total beverages a day. The AI for women is 2.2 liters (about 9 cups) of total beverages a day. A good general rule to follow is the 8 X 8 rule which is to drink at least eight 8-ounce glasses of fluid a day because all fluids count toward the daily total. To put that visually that's about 4 bottled waters a day, most bottled waters have about 17 fluid ounces in them. When looking at weight loss drinking the recommended amount of water a day will often times results in noticeable pound reduction if you are not already drinking that much water. The main reason for that is that by substituting water for any other beverage will usually mean you are consuming less calories and sugars a day. Now I have had many people tell me they need "flavor" in their drink at all times, they just cannot drink plain water. So if you are one of those people, try the flavored waters or adding flavor to your water using the Crystal Light or Mio products to help you drink more water. A lot of those products have zero calories or sugars. Good Luck and Drink Up! · Divide up the contents of one large package into several smaller containers to help avoid over-consumption. · Don't eat straight from the package. Instead, serve the food in a small bowl or container. Go ahead, spoil your dinner. As children we learned not to snack before a meal for fear of "spoiling our dinner." Well, it's time to trash that old rule. If you feel hungry between meals, eat a healthy snack, like a piece of fruit or small salad, that way you can avoid overeating during your next meal. Portion control in front of the TV. When eating or snacking in front of the TV, put the amount that you plan to eat into a bowl or container instead of eating straight from the package. It's easy to overeat when your attention is focused on something else. Portion control when eating in. To minimize the temptation of second and third helpings when eating at home, serve the food on individual plates, instead of putting the serving dishes on the table. Keeping the excess food out of reach may discourage overeating. Meet yourself half-way. You can reduce the calories of your favorite foods by 50% without changing anything about them -- just eat half. For example, if you usually eat a sub sandwich at lunch, eat half it, but swap your chips with carrot or celery sticks. Still hungry? Before reaching for the rest of your sandwich, chew on a piece of fruit. Produce takes longer to eat and digest than other foods, which means you'll have more time to notice you're getting full. Plus, the added fiber in both vegetables and fruit will help you feel more satisfied, for much longer, than chips would have. Resist the "upsize" offer. As we all know, fast food portions are already oversized, so there's no need to add insult to injury by upgrading your meal. No matter how much of a "better deal" it may seem, don't be tempted. In fact, steering clear of "meal deals" altogether is very wise. You're much better off ordering a grilled chicken sandwich, or even a regular hamburger (hold the mayo on both), along with a side salad, than ordering a combo that comes with a silo-sized soda, too. Kids meals are a good alternative at fast food restaurants; they contain what were considered normal-sized portions for us grown-ups a few decades ago. When it comes to losing weight and staying healthy it basically boils down to two factors: quality and quantity. You have to monitor what you are eating and how much of it you are eating. This section is going to focus on the quantity aspect of weight management and healthy living. Most of us do not realize how much food we consume in a day. For the majority of us we eat way more food than our bodies require. And as much as we would like to hang on to the slogan "What goes in must come out" that is technically not true. When we take in more calories and fat then our bodies need it doesn't get expelled out the other end but rather it is stored in our body as fat deposits. In the earlier blog I talked about what stress does to our bodies. Stress causes our bodies to go into survival mode which slows our metabolism and holds on to fat and calories. So stress on top of over eating is a double blow to our weight management goals. 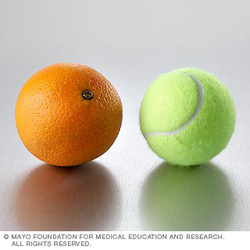 A single serving of fresh fruit as an orange is about the size of tennis ball. It is recommended that you have between 3-5 servings of fruit a day. 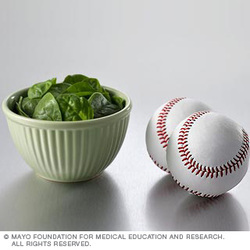 Two cups of raw leafy spinach are about the same as two baseballs and equals one vegetable serving. You should eat 4-5 servings of vegetables a day. 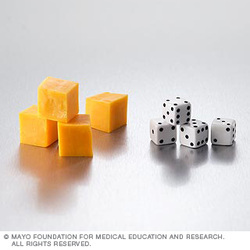 One and a half to 2 ounces of low-fat hard cheddar cheese is about the same size as three to four dice and equals one protein/dairy serving. Also one cup of milk equals a serving. Daily servings are 3-5. 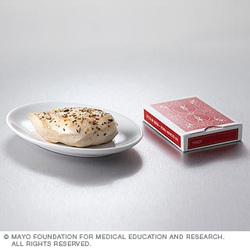 2.5 ounces of cooked skinless chicken or 2 ounces of cooked hamburger is about the size of two-thirds of a deck of playing cards and is one serving of protein. Daily recommendations is 3-5 servings. If you eat fast food hamburgers or chicken sandwiches think about how big the patty was on your last sandwich. Fast food restaurants do not follow the portion control rule. Beware! This really hurt my heart because I love pasta. 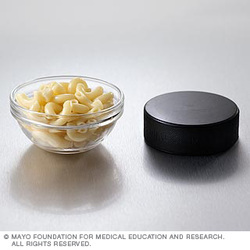 Half a cup of whole grain cooked pasta is the size of a hockey puck and equals one serving! It is recommended that we eat 4-6 servings of carbohydrates daily. Since carbohydrates are so important in maintaining a healthy weight but at the same time carbs get a lot of bad press I wanted to list additional examples of proper serving sizes for other types of carbohydrates. Carbohydrates are necessary for healthy living, we just have to be smart on how to consume them. I don't expect many of you to start cutting your meals in half starting today because of these pictures. This topic is meant to give you a perspective on how much we consume everyday and how much we overeat. Next time we will discuss tips on how to control your potions so hopefully you can start taking small steps toward reducing your calorie and fat intake and in turn reducing your weight. Hundreds of fad diets, weight-loss programs and out-and-out scams promise rapid and simple weight loss. However, the foundation of all effective weight-loss programs remains a healthy, calorie-controlled diet along with exercise. For successful, lasting weight loss, you have to make permanent changes in your lifestyle and health behaviors. It might seem clear to set realistic weight-loss goals. But do you really know what's realistic? Over the long term, it's best to aim for losing 1 to 2 pounds a week, although initially you might lose weight more quickly than that if you make significant changes — just be sure the changes are health supporting. To lose 1 to 2 pounds a week, you need to burn 500 to 1,000 calories more than you consume each day, through a lower calorie diet and regular exercise. A good way to determine if your weight is healthy for your height is to calculate your body mass index (BMI). BMI is a measurement of body fat based on height and weight. BMI can be used to indicate if are underweight, normal, overweight or obese. Being overweight puts strain on your heart and can lead to serious health problems. It is a measure of weight for height. For adults over 20 years old, BMI falls into one of these categories: Below 18.5 (underweight), 18.5-24.9 (normal), 25.0-29.9 (Overweight) and 30.0 and above (obese). Below is a type of BMI chart that medical providers use, although BMI charts can take a variety of forms. To use the table, find the appropriate height in the left-hand column labeled Height. Move across to a given weight (in pounds) along the top. The number where your height and weight meet is your BMI at that height and weight. Pounds have been rounded off. You want your BMI number to be in between 19-24 (the green area). I tried to make the chart as large as possible but if you can’t view it copy and paste this link to take you to the National Heart Lung and Blood Institute website. Just plug in your height and weight and get you BMI score instantly! your stress hormones. The result is your body holds onto fat more efficiently. Some medications that are prescribed to treat depression, diabetes, mood disorders, seizures, and migraines can cause weight gain anywhere from a modest increase to 10 pounds a month. If you are experiencing weight gain of 5 or more pounds a month without a change in your lifestyle your medicine cabinet could be to blame. Consult your medical provider about your medications if you are concerned about weight gain but never stop taking your medications without first talking to your medical provider. Stress response, whether it is 'fight-or-flight,' juggling too many responsibilities, or coping with financial pressures, triggers a response and our bodies go into survival mode as mentioned before. Our bodies store fuel, slow down metabolism, and dump out chemicals [cortisol, leptin, and other hormones] which are more likely to cause obesity in the abdominal region. Along with aging comes a natural slowing of your metabolism. Hormonal changes with menopause also causes hunger, depression, and sleep deprivation. Estrogen (female hormone) is what causes fat to be deposited in the hips and thighs for women. During menopause the levels of estogen dramatically decline and fat begins to be stored less in the hips and thighs and more in the midsection like men who lack high levels of estrogen. Saving the most obvious for last. Having a sedentary lifestyle where we see more of a television and computer screen more than the birds and trees outside causes our bodies to burn fewer calories and store more fat. It's no mystery that a diet full of fried foods, giant portions, decadent desserts, alcohol, and sugary soft drinks will lead to weight gain. As you can see some of the reasons for weight gain cannot be solved with just diet and exercise. Some causes require interventions with your medical provider. Knowing the root cause(s) of your weight gain can better help you formulate a weight loss plan. The next post will discuss determining your healthy weight. In the meantime please take a second to take my online poll. 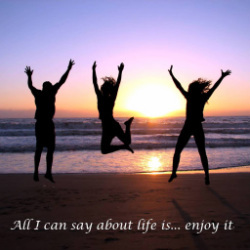 Happy Living! My name is Tiffany and I will be hosting this blog on healthy lifestyles for healthy living. I’m a North Carolina registered nurse, I work in public health and I love love love helping people live better lives! A lot of times we (myself included) take our health for granted until we start to experience how uncomfortable life can be when our health starts to deteriorate. For example, I’m just getting over a cold and let me tell you not being able to breathe out of my nose properly or taste the flavor of my food for 2 weeks was a very uncomfortable situation for me. But that was just a minor health problem that cleared up. Being in poor health often times leads to permanent damage like blindness, paralysis, loss of limbs, and chronic pain. When looking to change your health for the better it is best to take baby steps instead of gigantic leaps, that way you are more likely to stay on your feet instead of falling on your face. It is proven that drastic quick changes do not lead to lasting results but actually put you further behind than where you started and who on earth wants to do that? Hopefully this blog will give you tips that will help you take those baby steps toward better health and a better life. I will post pictures, videos, polls and anything else I can to help you get the most from blog. So get ready for some health news that you can use! Just so you know what I look like. This is me and my husband Corey.